Celebrating its tenth year, Climate Week NYC 2018 follows on the heels of this year’s Global Climate Action Summit in San Francisco and marks a key stop on the way to COP 24 events in Katowice, Poland, in December. Climate Week NYC is a global event run by The Climate Group in coordination with the United Nations and the City of New York, and occurs every year during the UN General Assembly. The aim of the week is to bring government ministers, investors, governors, CEOs and mayors from across the world to inform policy to make climate action a reality. 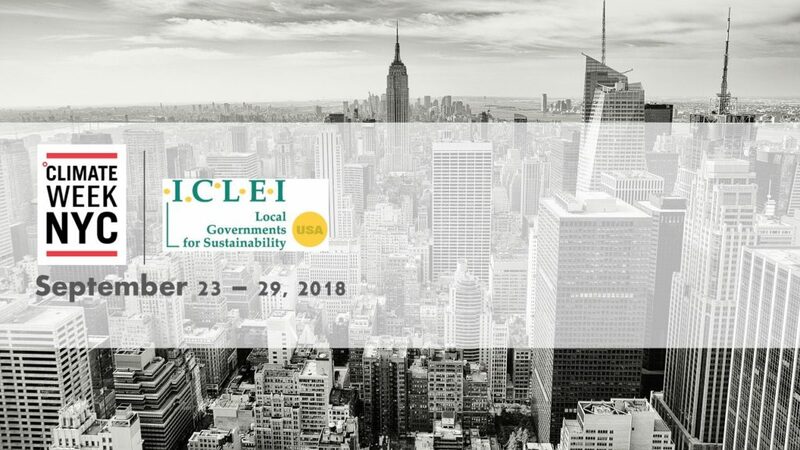 As such, ICLEI-Local Governments for Sustainability maintains a perennial presence on the ground in New York City throughout the week, serving as a leading voice for local leadership on climate and sustainability. Highlighting the important and long-standing partnership ICLEI has with New York City itself, evident most recently in their collaboration to release at the Global Climate Action Summit the first in-depth case study on the City’s decision to divest from fossil fuels. From 24-30 September, ICLEI will join several Climate Week NYC affiliate events that strengthen our key partnerships and lend support to the outcomes above. Throughout the week, ICLEI will provide announcements, including on reinvigoration the pioneering Five Milestones Awards, whereby the Village of Larchmont, New York, will be awarded for achieve all five of the Five Milestones for Emissions Management, ICLEI USA’s stepwise path to emissions reduction utilized by hundreds of local governments during the past 25 year. Larchmont will be recognized for exceeding its emissions reduction target years ahead of schedule following the Five Milestones. This entry was posted in CityTalk USA and tagged climate action, Events, NYC. Bookmark the permalink.